Eggseeds will provide visits for any community group that is interested. Whether this be a group interested in keeping chickens or ducks or simply who would enjoy the pleasurable experience of meeting our little feathered friends, or for any groups interested in domestic poultry life cycle. Please feel free to contact us to discuss your needs and how we can satisfy them, as well as our flexible pricing structure. 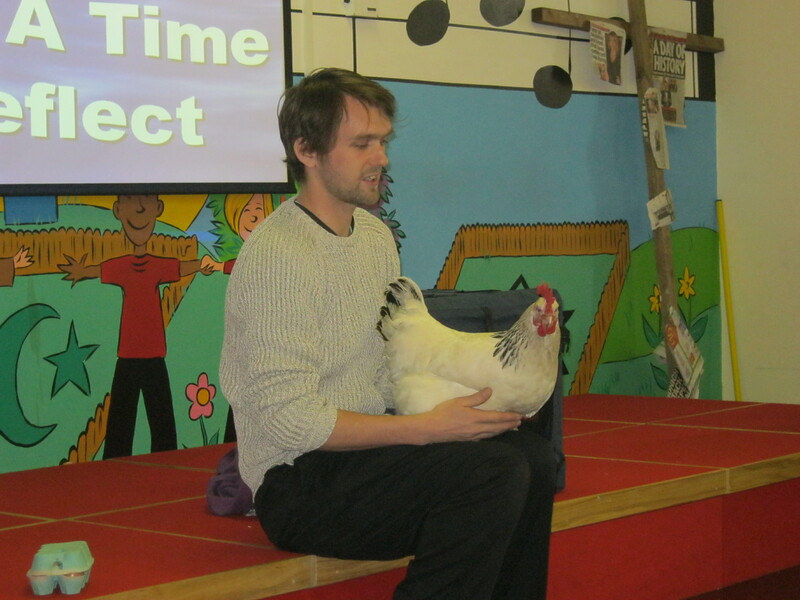 School visits are the first stage of introducing the children to the prospect of raising chickens. They take the form of a talk by Sam in which he introduces the life cycle of a chicken from egg to adult. The group will be shown eggs and chickens and have a chance to ask questions and meet the animals. They can see them at close quarters and observe their behaviour. In the first picture Sam can be seen presenting the talk to a full school assembly. Below are some photographs of the children's experience of incubating eggs and keeping young chicks from entries in their school blog. After the hatching project is completed the chicks are usually taken away to be looked after in various flocks and can be re-introduced to the children at various stages of their development or when full grown. Furthermore, if the school wishes Sam will install a living area within your grounds so that you can keep your own flock and gather fresh eggs which gives the children a valuable insight into handling and managing domestic animals. This is Sam, he’s the chicken man! He brought the eggs to us, he also brought a hen called Kay. She lays one egg everyday, some of our chicks will grow up to look like Kay. In two weeks time Sam will come back to show us his other chickens and take the chicks to live on a farm. We have been learning about what things a chick needs! We learnt about what is inside a egg, the yolk to feed a chick, the albumen to protect the chick and the chick. We also looked at the shape of an egg and decided that eggs are not spheres so that they don’t roll out of their nests. We are always careful with the incubator. 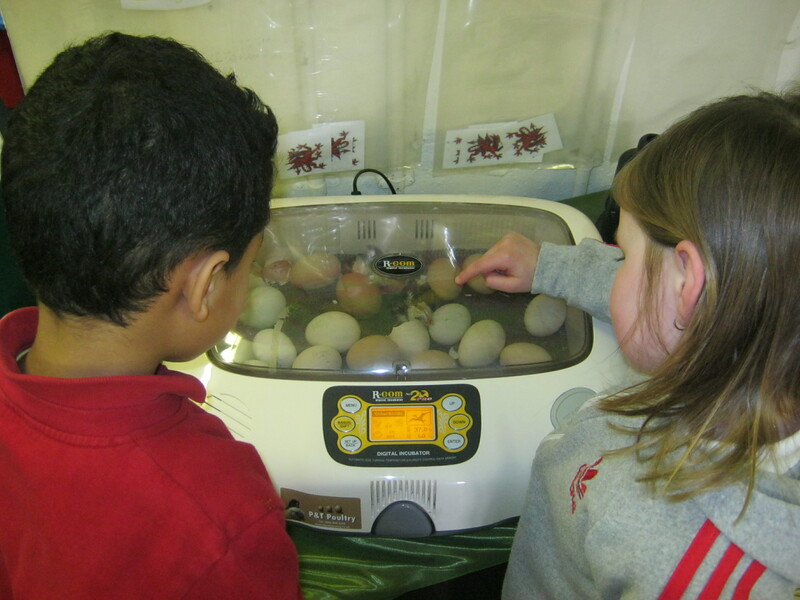 We love watching the chicks but we know how to be careful near the incubator, we never press the buttons. The chicks follow your fingers if you gently put them on the lid. We have been cheeping to them too! Today we all held John Paul! 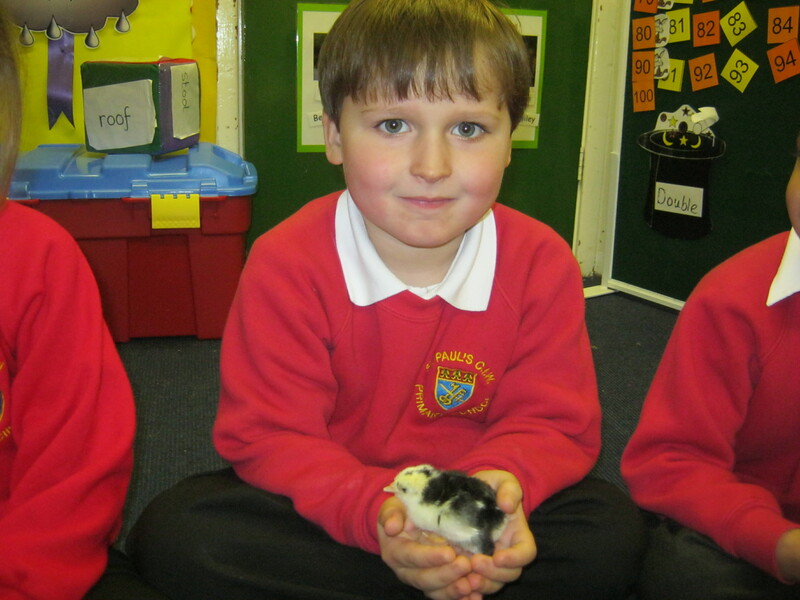 We were so excited today to hold a chick for the first time, we all held John Paul as he is the eldest. He was so delicate we had to be very careful and he tried to jump off our hands! He was soft and tried to peck us but it didn’t hurt as he’s only a baby. This gallery shows some return visits when children get to meet their previous hatches and other animals that we maintain. John Paul and Benedict move house!